If you’ve seen the previews or read about the new Swedish film The Last Sentence, you will most probably come to the conclusion that the movie is about a brave man, one Torgny Segerstadt, who spent his later years as a newspaper editor fighting against fascism in the 1930’s during the rise of Nazism. But if you actually see the movie, you quickly discover that this is only a small part of the story, and that the film is really about Segerstadt’s relationship with three women: his mother who died when he was young and whose death haunted him the rest of his life; his disintegrating marriage to a woman who spiraled into a depression after the death of one of their sons and for whom he has lost all affection; and his love affair with the Jewish owner of the newspaper he runs, a drug addict whose husband knows about the affair and who is not particularly bothered by it. Yes, he does write editorials against the Nazis. Not everyone did that and it did cause him some problems and I don’t want to downplay what he did. He was certainly a very brave man, a man of deep principle. At the same time, it might be understandable why the film’s focus is more on his personal life than the political arena because, as brave as he was, there isn’t a lot of conflict or tension in this part of his life since it’s not long before Germany turns against Russia and declares war on its former ally. At that moment, Sweden no longer found itself in that much immediate danger of Nazi aggression and so the fascist threat against Segerstadt turned out to be a sort of paper tiger. Of course, since he didn’t know that, he certainly must be celebrated for his courageous stand. But at the same time, such an anti-climax doesn’t really help with creating drama in a movie. As for his personal life, there’s nothing that particularly original or exciting or interesting there either. Segerstadt is pretty cruel to others and more than a bit of a narcissist. And though he is visited by the “ghosts” of the female characters in his life, it’s not as if he feels all that much guilt or inner conflict over any of it. And when he does feel something, it comes across as crocodile guilt. I’m not sure that anyone connected with the film intended Segerstadt to come across that way. I’m sure they found his life fascinating. And I wish I did, too. But for me, when a character’s personal life isn’t particularly interesting and his outer life lacks much excitement, either the filmmakers have a subject they can’t make come to life or they haven’t found a way to bring him to life. So in the end, it must be said that The Last Sentence is not a particularly interesting or exciting movie. In fact, to be ruthlessly honest, it’s like watching paint dry, and even, worse, it’s not in color, so it’s like watching black and white paint dry. The screenplay is by Klaus Rifbjerg and legendary director Jan Troell (The Emigrants and the New Land). In 1996, Troell did a biopic about a character the polar opposite of Segerstadt, Hamsun, a story about a Nobel Prize winning author’s support of Hitler. While that movie, starring Max Von Sydow, was involving and intriguing, neither Rifbjerg nor Troell can do much to get the blood flowing here. With Jesper Chrsitensen as Segerstadt. He gives the character a certain grave respectability and does what he can with the role. 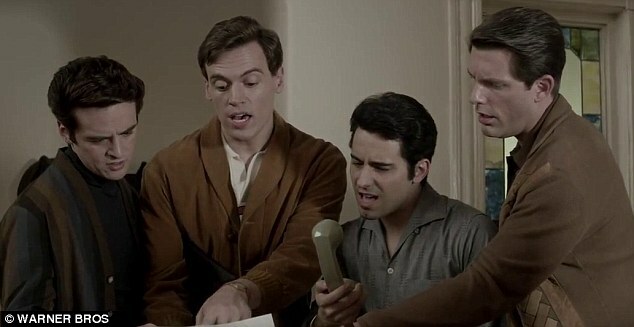 At the end of the movie Jersey Boys, the biopic of the singing group The Four Seasons (you know, the foursome headed by falsetto voiced Frankie Valli that gave us such hits as Sherry, Big Girls Don’t Cry, Walk Like A Man, etc., etc.? ), the quartet is singing under a streetlamp. Suddenly, they break out into a huge, over the top, Broadway style rendition of their song as they are joined, bit by bit, by all the various cast members, no matter how small or large their parts. It’s an exhilarating moment, a big stage style dance number, like something out of a Bollywood musical, and it suggests what the film could have been. But I’m afraid to report, the movie as a whole never really comes close to this thrilling final few minutes. Jersey Boys is a film version of the hit stage musical with a solid but rather so so screenplay by Marshall (long time, no see) Brickman (he’s actually a wonderful writer, but somehow never really made his mark once he stopped working with Woody Allen on such movies as Sleeper, Annie Hall and Manhattan) and Rick Elice (new to screenwriting). The duo wrote the book for the original Broadway production. They do some interesting things structurally, basically borrowing from the movie Citizen Kane in which each section is narrated or told from the viewpoint of one of the participants. And at one point, the authors suddenly stop and go back two years to dramatize the events that led up to a major confrontation. At the same time, while this structure in …Kane was a way to dig deeper into the enigmatic character of the title character (with the ironic conclusion that one can never really know what makes someone who he is), here the structure results more in a series of anecdotes, some funny, some dramatic, punctuated by songs, that do little more than tell the story and get information across to the audience. And it’s often filled with clichés and awkward stagings, with much of the drama happening off screen. Frankie Valli has one of those big arguments with his wife who is tired of his going on the road and sleeping around, soon followed by one with his daughter about how distant and terrible a dad he is. Not only are these scenes so second hand the audience could write the dialog themselves (at one point, his daughter tells him to stop giving him excuses, she’s heard it a billion times—my immediate thought was, So have I, my dear, so have I), the conflicts that lead up to these confrontations take place off screen, making these scenes little more than exposition. Other parts are a bit awkward and unclear. There’s a major meet up between the group and some mobsters in which a deal has to be reached concerning the monetary failings of Tommy DeVito, the one who started the group. By the time the dust had settled here, an agreement had been reached, but damned if I was quite sure what it was. And the movie ends with Valli talking about the first night the four singers found their voice, singing Sherry, Sherry Baby under a streetlamp, outside, in the middle of a block. Except that in the movie, this scene happened in one of the character’s home over a telephone. In the end, about the only original part of the story is the somewhat theatrical (as one of the characters put it) record manager that discovered the group and made them stars, Bob Crewe. A guilt free gay man living during the 1950’s, relishing in his flamboyancy, it’s a character that has rarely been seen on the screen. And Mike Doyle brings such energy and joy to the part, that he steals every scene he is in. The movie is directed by Clint Eastwood and at least one can say, with great relief, that it’s no J. Edgar. He does his usual job of getting the job done. Eastwood, as a director, has always been at the mercy of his screenplays (of which he has directed very few great, or even that good, of ones). And since there’s nothing special here, there’s nothing really that special on his end either. I wish I could say he finds ways to give the movie forward momentum or tension, but instead, the whole thing just sort of plods along. In fact, again to be ruthlessly honest, the more the film went on, all I could think was what it would have been like if it had been written by Nicholas Pileggi and Martin Scorcese had directed it. 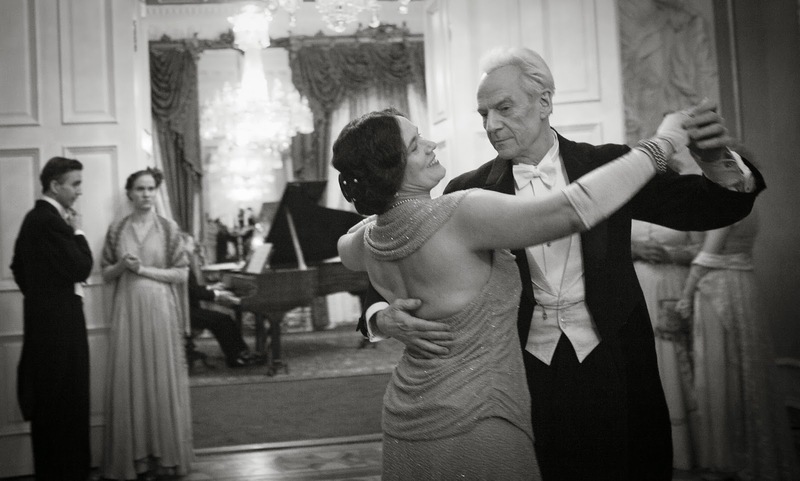 The major virtues of the movie lie in the stunning feel the production and costume design bring to the film, a design full of deep and abiding affection for the period. And it’s all backed with a slightly hazy feel to the cinematography (by one of Scorcese’s faves, Michael Ballhaus), as if the camera had been fogged over a bit by Vaseline to give it that slight touch of nostalgia the period deserves. The cast includes Vincent Piazza (Lucky Luciano of Boardwalk Empire) as Tommy DeVito; John Lloyd Young as Frankie; Michael Lomenda as Nick Massi; and Erich Bergen as Bob Gaudio, who wrote all the songs. Many of them are recreating their stage performances. They all, like Eastwood, get the job done, but I never felt that strong an emotional connection to any of them. Christopher Walken is also around as a mobster; he’s not given much to do, but he’s always nice to see.